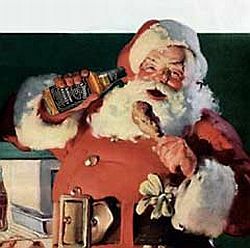 After the big night, Santa typically unwinds with chicken wings & Jack. To me, Christmas has always seemed a bit less confusing than other holidays for the at-home sommelier. Unlike Thanksgiving, where you sit down to ten courses and 10,000 calories at once, it’s a great day to spread the drinking around — Champagne with brunch, maybe a nice white wine or light red in the afternoon, and then a couple of big reds with dinner. 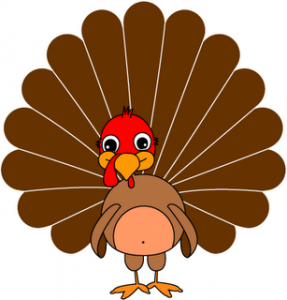 So what’s on your holiday menu this year? Let us know in the comments! Big News! To celebrate Cyber Monday, Terroirist.com has teamed up with Weygandt Wines to launch a unique wine-of-the-month club. All the selections are handpicked by me and the team at Weygandt. All the wines will expand your palate by introducing you to new regions and producers. And all will be delivered directly to your doorstep. Our selections aren’t narrowly defined (e.g., there will never be a “red-only” option). But we pledge to offer distinct, compelling wines that represent great value and quality. 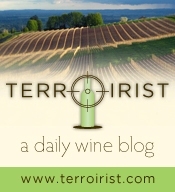 Everyone from full-fledged oenophiles to aspiring wine aficionados will want to join the Terroirist.com wine club. It also makes for a great gift! To join, call our wine club staff at 202-362-9463 or contact me. Perhaps the only common ground? That you should have a lot of wine on hand. So what will you be having? Oregon Pinot? Central Coast Syrah? Champagne? Manischewitz? Let us know in the comments! Two years ago today, I launched Terroirist.com. It’s been quite a ride. 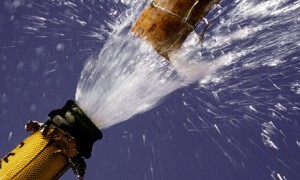 Last year, the site was named the “Best New Wine Blog” of 2011. This year, it was one of just five finalists for the “Best Overall Wine Blog” of 2012! Traffic continues to grow, and more and more wine lovers across the world are making Terroirist a part of their daily lives. 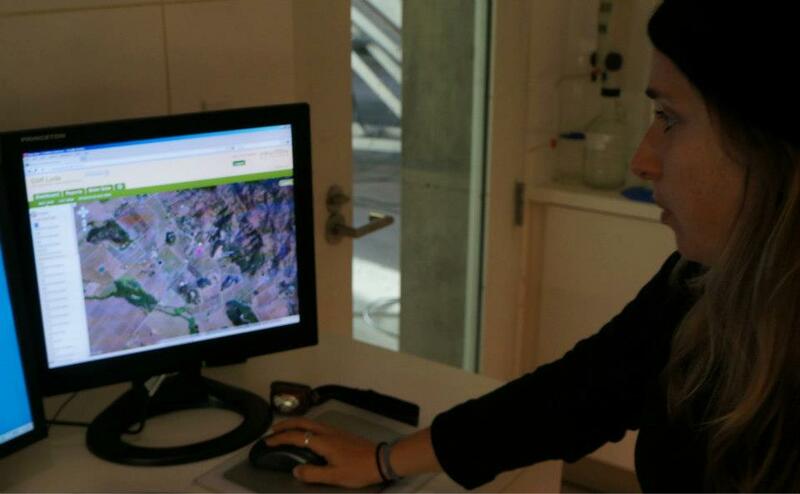 Today, the site attracts a whopping 20,000 visitors each month. If you haven’t already, please “like” us on Facebook and “follow” us on Twitter! And thank YOU, dear reader, for taking the time to visit! My fifth and final day began just before 7:00 am at Stags’ Leap Winery, where I joined the assistant winemaker in touring the property’s vineyard to monitor the harvest, which was in full swing. At 10:00 am, I headed to Odette Estate, a brand new winery on the Silverado Trail. 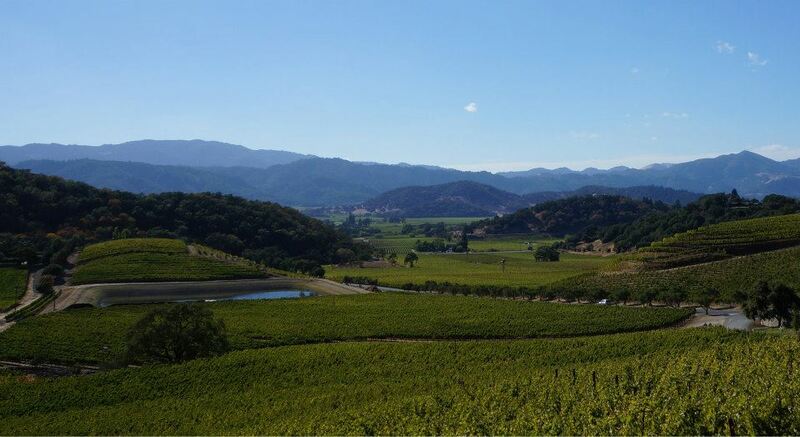 Located on the former site of Steltzner Vineyards, one of the oldest vineyards in the Stags Leap District, the property was purchased by The PlumpJack Group in February of this year. 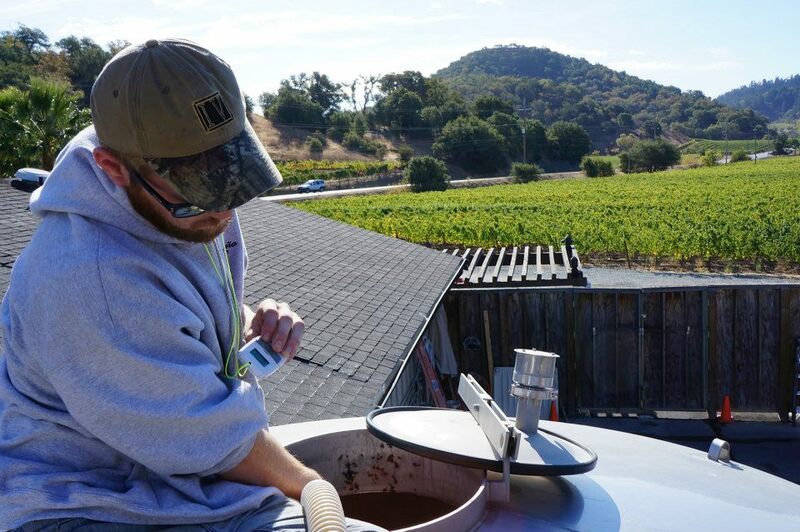 Plumpjack put Jeff Owens – formerly the assistant winemaker at CADE – in charge of winemaking, and obviously has very high hopes for the property. 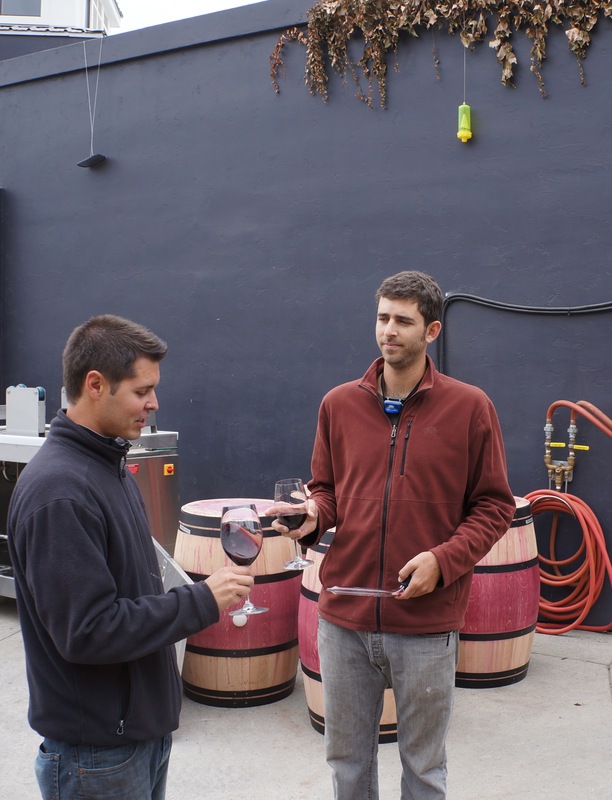 Winemaker Jeff Ownes chatting with his assistant. Upon my arrival, Jeff put me to work with pump-overs, barrel punch downs, and tank sampling. Afterwards, we walked around the 36-acre vineyard — much of which is being re-planted — and Jeff showed off the property’s plantings Tintoria, an obscure Portuguese grape, and Pinotage. Jeff also gave me a tour of the property’s caves, which are currently being updated and retrofitted. 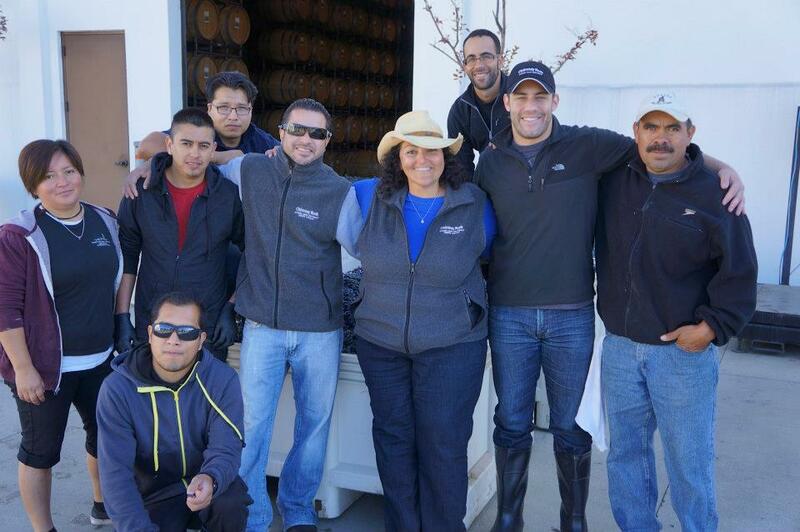 At around 12:30, we sat down for lunch with the entire harvest crew. About an hour later, I headed back to Chimney Rock to meet with Doug Fletcher, who oversees winemaking for the entire Terlato Wine Group. Doug didn’t put me to work. Instead, the two of us headed out for a 2.5-hour vineyard walk, where I picked his brain on anything and everything. The conversation was incredible. 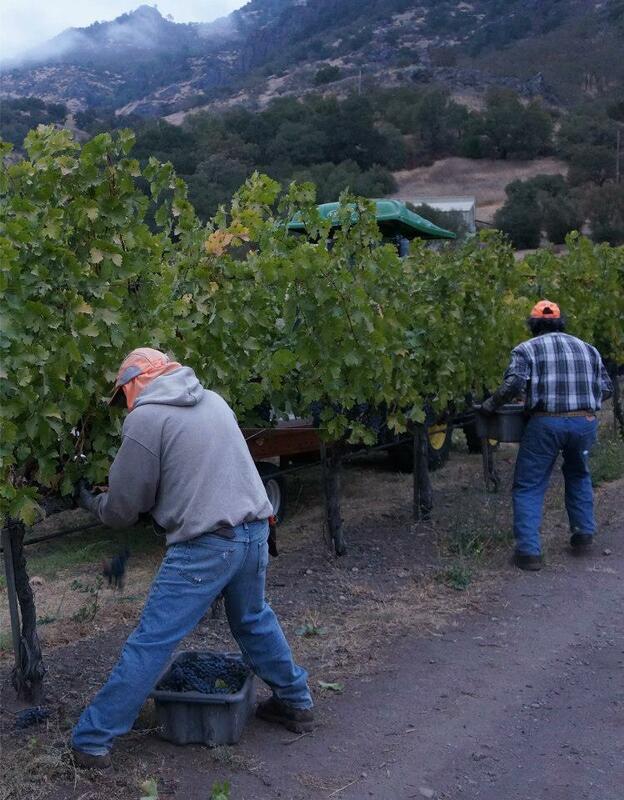 Doug has been working with Stags Leap District Fruit for nearly 35 years – and working at the Chimney Rock property since 1987. So when it comes to winemaking in the Stags Leap District, one could easily argue that Doug is up there with legendary vintner Warren Winiarksi with his knowledge of the terroir. Without question, spending so much time with Doug was the highlight of my trip. So it was a wonderful way to end things! Day four began just before 7:00 am at Stag’s Leap Wine Cellars, where Kirk Grace, the property’s vineyard manager, promptly invited me into his pickup. We then headed into the vineyard with grape shears, a digital fish scale, and about a dozen five-gallon buckets. Kirk needed to project the yield of the grape crop that was about to be harvested — so we selected random rows, pulled all the grape clusters, and then weighed them to project the total yield. 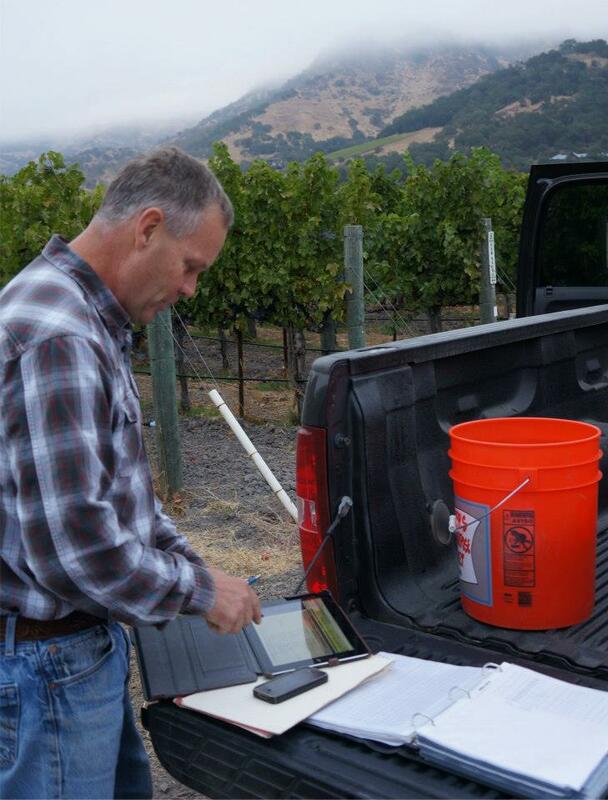 Kirk Grace, projecting grape yields. While pulling grapes, I learned about Kirk’s history in Napa Valley. 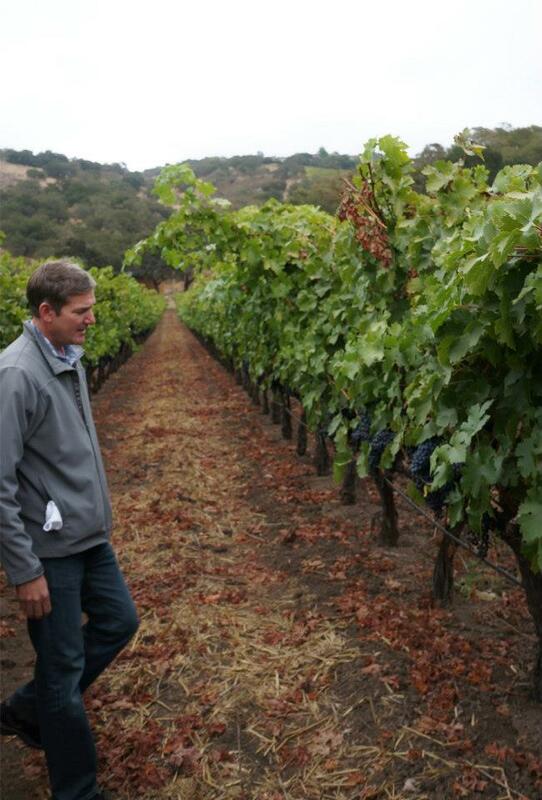 Kirk’s resume includes stints at St. Supery Vineyards, Bettinelli Vineyard Management, and Robert Sinskey. 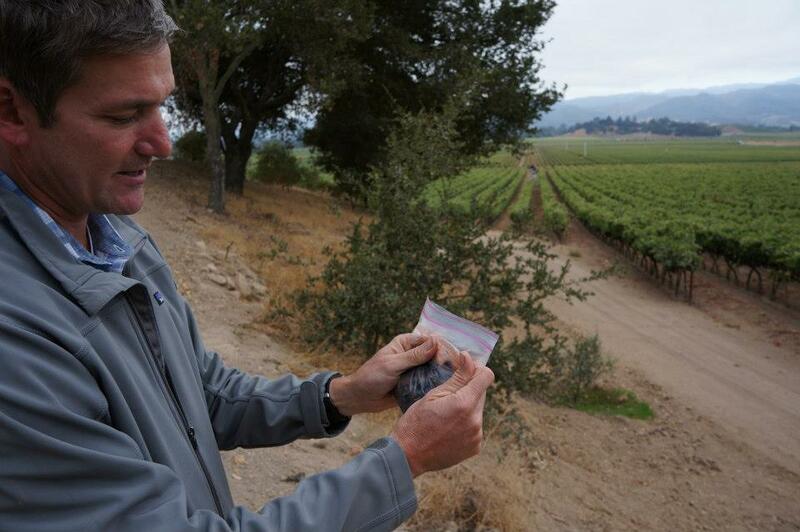 He’s been with Stag’s Leap Wine Cellars since 2006, where he oversees the company’s 142 acres of estate vineyards. After about an hour, I linked up with Nicki Pruss, Stag’s Leap Wine Cellars’ veteran winemaker. Unlike Kirk, Nicki didn’t set out to work in wine — she started her professional career as a podiatrist. But in 1995, during a long bike trip through the wine regions of France and Germany, she realized that her heart was in wine. So when she returned, Nicki began studying winemaking at Napa Valley College and making wine at home. In 1998, she landed an internship at Stag’s Leap Wine Cellars and has been there ever since, becoming the head winemaker in 2005. Tasting through various "factions" of pressed juice. Nicki toured me through the entire operation, which was humming with activity as tons and tons of grapes were being processed. Our most interesting activity was tasting through the various “factions” of juice produced from initial pressing through subsequent — and harsher — pressing. At 9:50 AM, I hopped in my car and drove to Malk Family Vineyards, the smallest producer in the Stags Leap District. I was met by Robbie Meyer (better known for his two personal labels, L’Angevin and Peirson Meyer), and we quickly started walking the property’s two-acre vineyard. While walking, we filled a ziplock bag with various grapes, crushed them, and poured the juice into a portable refractometer to measure the sugar content, or brix, of the grapes. We then headed to the vineyard at Regusci Winery to do the same thing, as Malk sources some fruit from there. 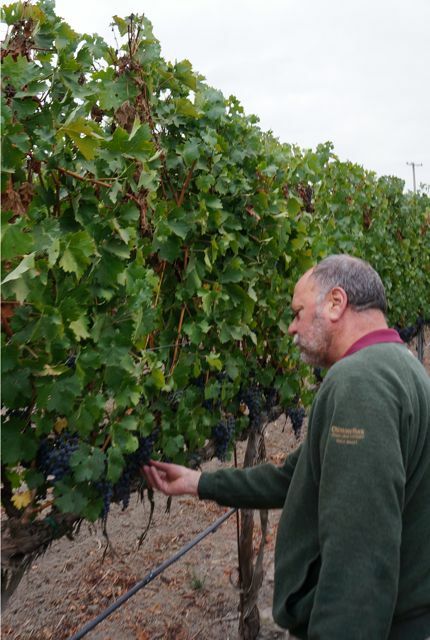 Robbie Meyer, walking the Regusci Vineyard. Brix testing at the Malk Vineyard. Later that afternoon, I headed back to Chimney Rock Winery for the official release of the Stags Leap District Winegrowers’ 2008 Appellation Collection, where I was able to taste through 2008 offerings from all 18 member wineries. Favorites included Chimney Rock’s 2008 Ganymede Vineyard; Hartwell Vineyards’ 2008 Estate Reserve; and the Malk Family offering. At about 9:00 PM that evening, Jim Regusci reached out to see if I wanted to go watch some nighttime picks. So we hopped in his pickup and spent the next two hours driving through Stag’s Leap, Oak Knoll, and Carneros watching various crews hard at work — some hand harvesting and others on machines. It was awesome. Day three began just before 7:00 am at Cliff Lede Vineyards, where I was met by Remi Cohen, the director of winemaking and viticulture. We started with some (much-needed) coffee and egg sandwiches. 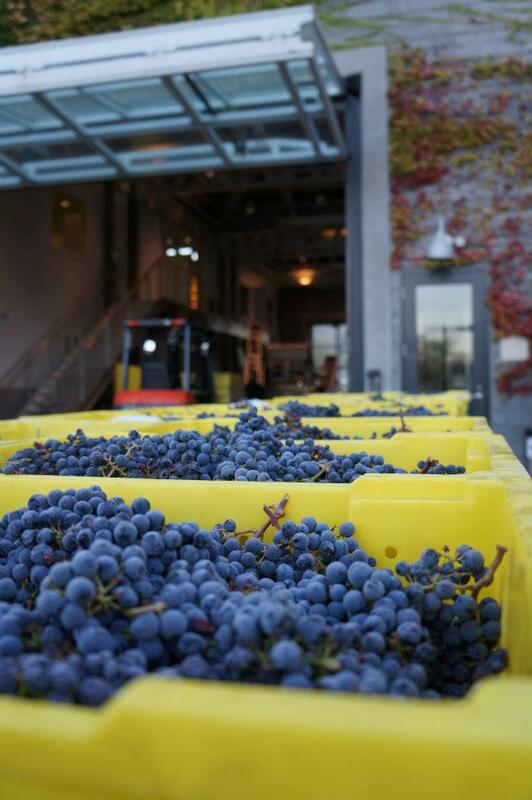 After finishing breakfast, we headed to the winery — where grapes were piled high waiting to be sorted. After quickly checking on everyone’s progress — and sampling some of the just-picked grapes — we headed to the tanks to taste through the fermenting wines. 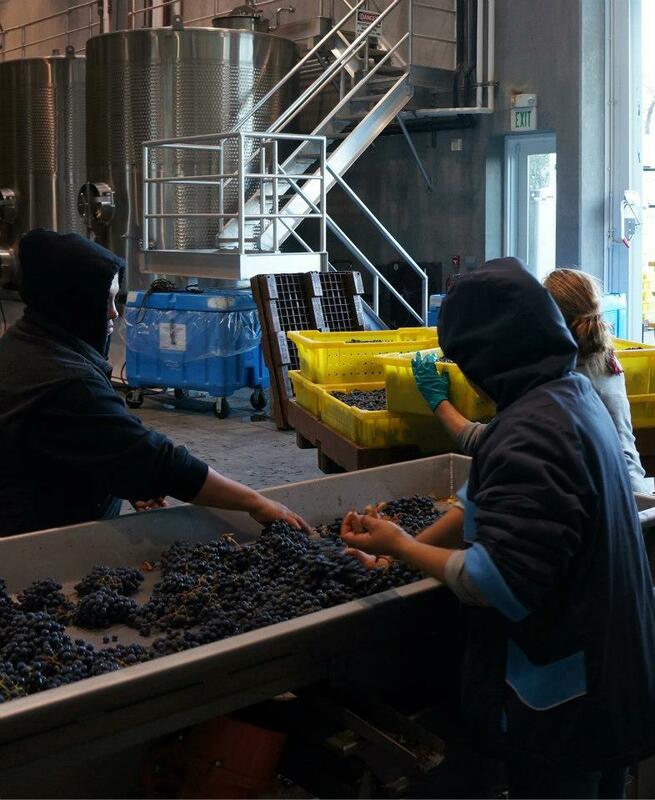 Grape sorting at Cliff Lede. 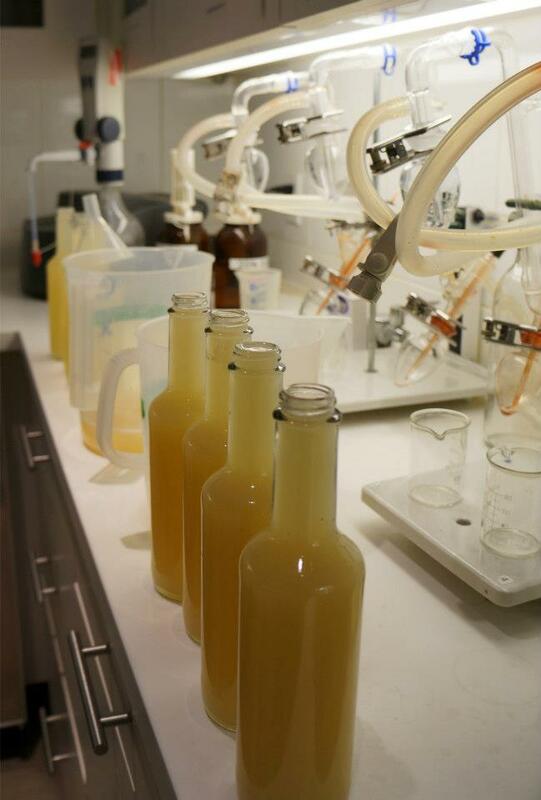 Sauvignon Blanc in the lab at Cliff Lede. Learning about irrigation management at Cliff Lede. We finished the morning with some grape sampling over by Poetry Inn — where I enjoyed some stunning views! Stunning views at Cliff Lede. At 9:50, I hopped in my car and drove to Baldacci Vineyards. The Baldacci property traces its roots to 1997, when Thomas and Brenda Baldacci purchased the 17-acre property as an investment. The investment soon became a passion project, though, as Thomas kept dreaming up ways to delay selling the property. About ten years ago, it became clear to the entire family that the winery wouldn’t be sold — and that the new plan was to build a lasting legacy for the family. When I arrived at Baldacci, I was met by Thomas’s son, Michael, who recently graduated from college and decided to join the family business. 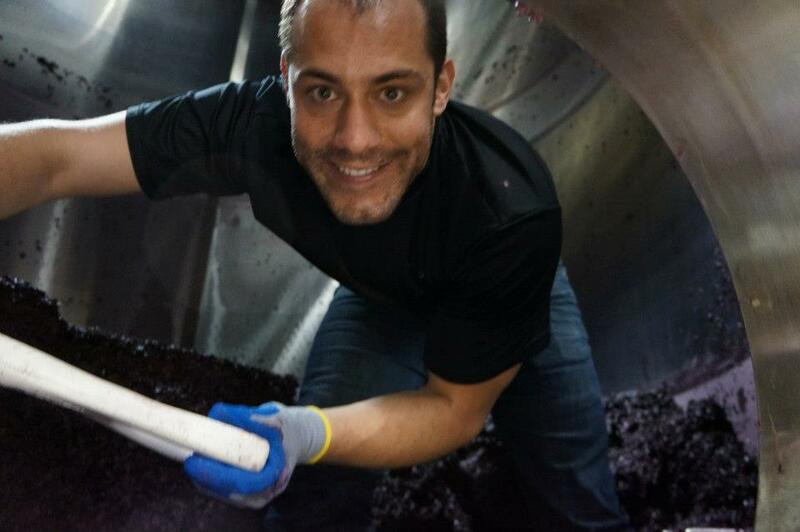 After quick introductions, Ricardo Herrera (who heads up the winemaking team together with his brother Rolando) put us to work with some pump overs. So for the next two hours, Michael and I took turns holding an extremely heavy hose over each tank. Helping Michael Baldacci with pump overs. While the work wasn’t terribly stimulating, it was fun to hang out with Michael, learn about the family’s vision, and hear about the Napa Valley Vintners’ Harvest Beard Contest. At about 12:30, Michael’s father came to join us, and the three of us sat down for lunch. An hour later, I hopped in my car and drove to Taylor Family Vineyards, one of the most beautiful spots in the Napa Valley. When I arrived, I was greeted by Pat Taylor and her daughter Sandy (who works as the winery president), who together shared the history of their family’s winery. The 23-acre property was purchased in 1980 — and at the time, it wasn’t planted with any grapes. So the family embarked on an ambitious project to convert ten acres of the ranch to vineyard. Over the next two decades, the family would simply sell the fruit. But in 2002, they decided to make their own wine — so a new, 1,000-case label was born. Today, all the wine is sold directly to consumers. The wine is made offsite, so rather than put me to work, Sandy walked me through the vineyard to show off the vines. While my third day certainly wasn’t as difficult as days one and two, it provided a much-needed mid-week break… and helped me recover from the brutal workout at Silverado! 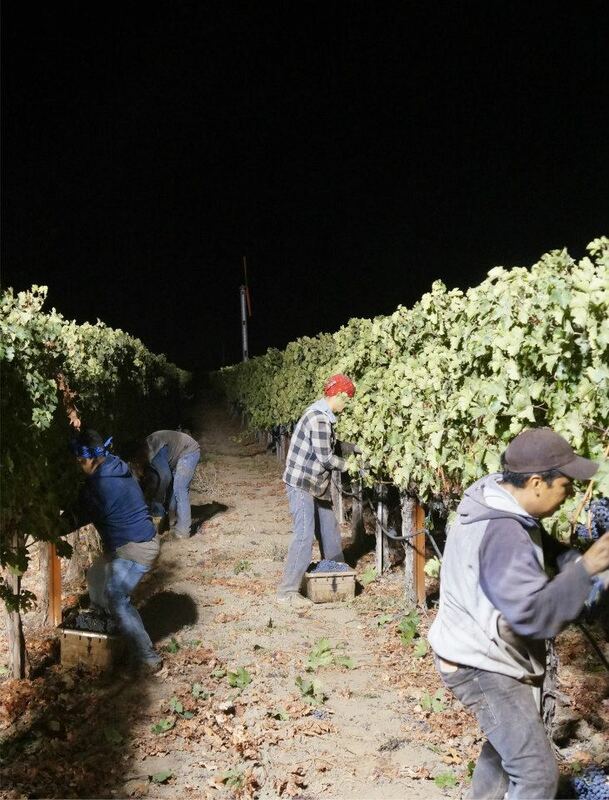 Day two began just before 7:00 am at Silverado Vineyards. When I arrived, veteran winemaker Jon Emmerich asked if I was ready to work. So when Jon introduced me to Elena Franceschi, his assistant winemaker, and told me it was time to do tank samples, I was a bit disappointed. By that point, I was ready to start sweating — where were the punch downs? Couldn’t I help out by grabbing a rake or a shovel, or just lifting something heavy? Once the tasting began, however, I realized how fortunate I was. Jon and Elena have been making wine together at Silverado for nearly 20 years — so watching them work together was a bit like watching Bruce Springsteen and Clarence Clemons share a stage. The teamwork was truly impressive. And as a spectator, it was tremendously educational to watch them talk and taste. When the samples finished, Jon told me to grab my rubber boots — as it was time to shovel out a tank. Twenty-three tons of Silverado’s Mt. George Merlot had recently finished fermenting, so it was time to drain the tank, shovel out the pomace, and press out the juice. Once the tank finished draining, we opened it up and started shoveling. And once there was enough room for me to hop inside, Jon’s team sprayed my boots with alcohol to sanitize them and sent me inside. Shoveling out the tank. The smile quickly vanished. Jon suggested I give it a try for just a few minutes. If I was feeling particularly ambitious, he said I might have the energy to shovel out half the tank. I saw this as a challenge, and pledged to myself that I’d finish the entire thing. It was absolutely grueling. By the time I exited the tank, I was absolutely drenched in sweat, short on breath, and a bit light-headed. It took just over 20 minutes, but it felt like I was in there for hours! After catching my breath, Jon and I hopped in his pickup to visit the Mt. George Vineyard in Coombsville, where Cabernet Sauvignon was still on the vine. We pulled some grapes to bring back to the lab, but it was clear that all the fruit was in excellent shape and just a few days away from coming off. 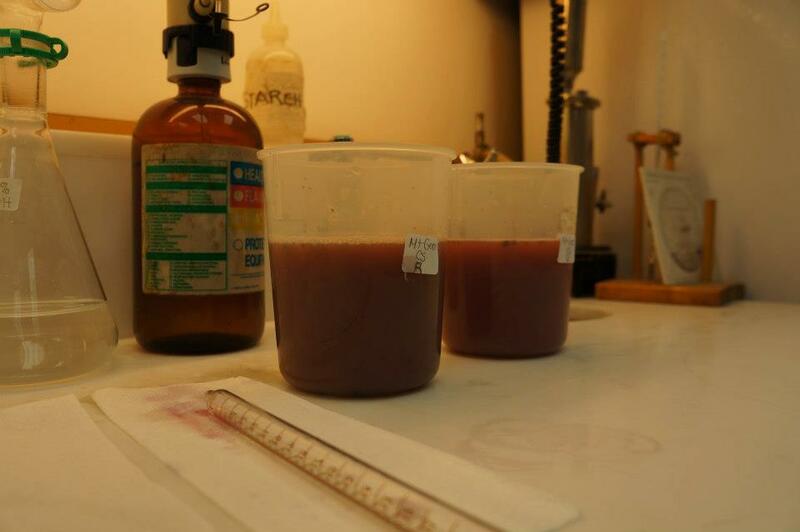 Upon our return, Jon sent me to the lab with the grapes, where we crushed out some juice and tested for brix and acid. 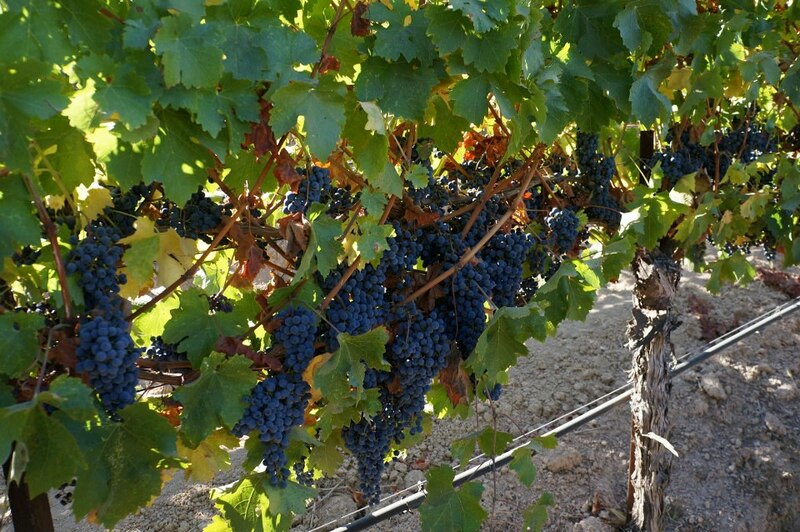 Cabernet Sauvignon at Silverado's Mt. George Vineyard. Working in the lab at Silverado. We finished up around 12:30 and headed to lunch at Redd Wood with Russ Weis, the general manager at Silverado. It was a wonderful break — and I got to taste some of Silverado’s Mt. George Merlot. 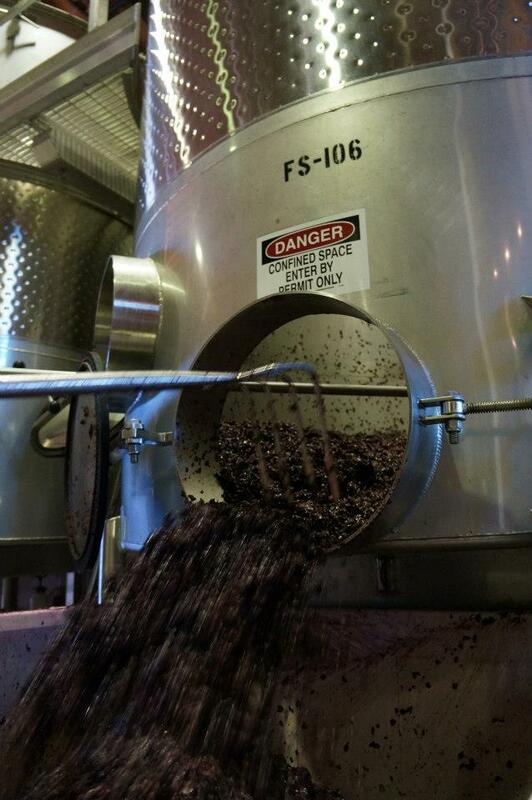 It was one of the most electrifying wines of the trip — while I was certainly influenced by the fact that I’d just shoveled out a tank of the same wine, it was heartening to see that some folks are, indeed, making delicious Merlot in Napa Valley. After lunch, I headed to Regusci Winery, where I met Jim Regusci, the owner, and Bertus Van Zyl, a South African winemaker who is helping with harvest at Regusci and T-Vine Cellars. 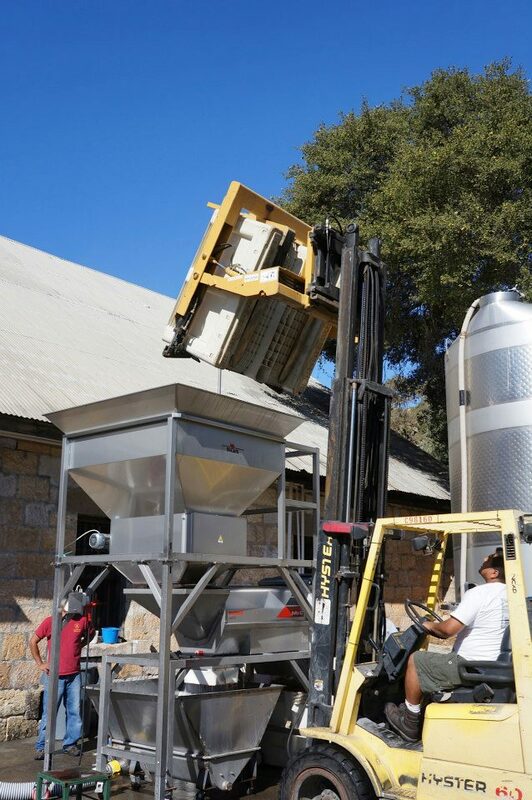 Bertus and Jim got me started with some basic cleaning (about 90 percent of winemaking, from what I can tell) and then taught me how to operate a forklift. There were dozens of bins (some full, some empty) to move and they needed an extra forklift operator. After getting the hang of things, it was a blast! At about 5:30, we headed to the property’s former slaughterhouse (which is now a kitchen/dining room), where the winery’s chef, Angel Perez, had a delicious dinner waiting for us. Several members of Jim’s business team joined us for the meal, and we chatted about everything — winemaking trends, the three-tier system, etc. It was another fantastic day! Three weeks ago, Chuck Hayward of JJ Buckley wrote those words in announcing the decision of three staffers to work harvest this fall. While I’ve never been fond of bees or snakes, I’ve long looked forward to one day working harvest. 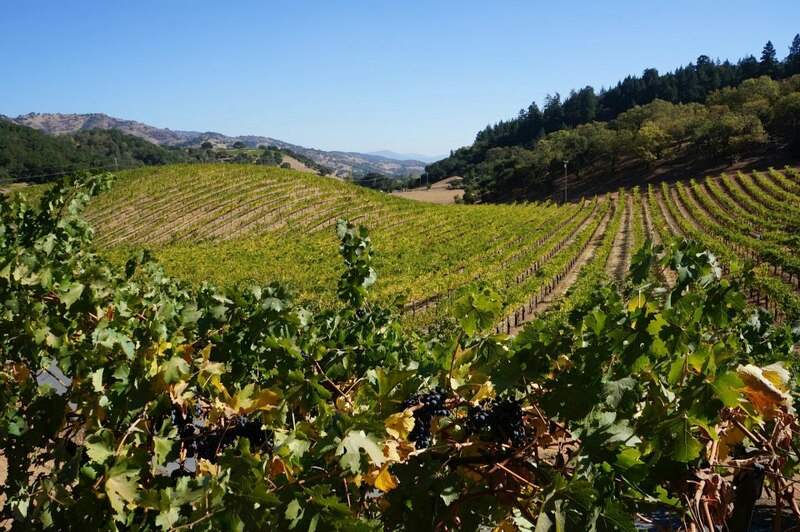 So when Elizabeth Vianna of Chimney Rock Winery reached out to see if I’d be interested in doing a one-week harvest immersion with the Stags Leap District Winegrowers this year, I jumped at the opportunity. Will I reach the same conclusion as Chuck Hayward — and take pleasure in the work, knowing that I’m playing an extremely small role in in bringing the joy and pleasure of wine to people? Or will the backbreaking, arduous labor of harvest break such notions? Be sure to keep an eye on the blog (and follow us on Facebook) for regular updates this week!